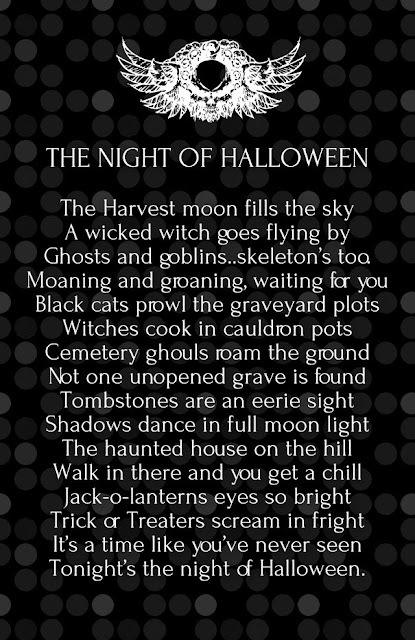 Happy Halloween, All Hallow's Eve, and Samhain! With the Apron and Shrine Fez, the Scottish Rite cap stands out as a distinctive piece of Masonic regalia. The Scottish Rite caps are first bestowed upon Masons who have progressed to the 32° and there are a variety of caps, differing with their colors and insignia which can confuse new members or those who are not members of the Ancient & Accepted Scottish Rite. The purpose of the Scottish Rite cap is for Masons to show to Almighty God as well as to identiify a degree and any honors one may have achieved in the Scottish Rite. According to the Supreme Council, the cap is considered a part of the apparel and is not removed, evn for prayer and the presentation of the flag. 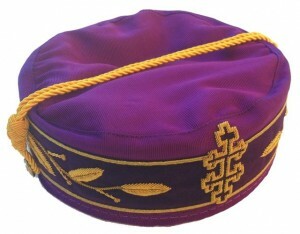 The Scottish Rite cap is not to be worn in any public place not connected to a Scottish Rite meeting. Note that I am speaking primarily of the caps worn by Masons of the Southern Jurisdiction of the Scottish Rite. There are some key differences between the Southern Jurisdiction (SJ) and Northern Masonic Jurisdiction. The NMJ has a cap for officers that are yellow, but that is not a practice in the Southern Jurisdiction. The black cap adorned with the Scottish Rite double-headed eagle is worn by those who have advanced to the 32° - Master of the Royal Secret. This cap is worn by a majority of the members of the Scottish Rite. 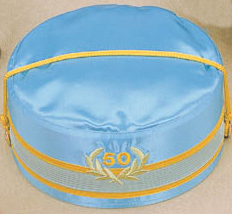 The blue cap emblazoned with golden number 50 surrounded by a wreath is worn by those Scottish Rite Masons who have been a member for atleast 50-years. The red cap decorated with the red and gold cross of a Knight Commander is worn by those 32° Scottish Rite Masons who have been invested with the Knight Commander of the Court of Honor (KCCH). When one has been a 32° for atleast 4-years (roughly) can be nominated for their services to the Rite to be awarded the KCCH. It should be noted that this is not a degree, but an investiture to recognize faithful service and does not confer any more power or authority. The KCCH exists in the Supreme Council of the Ancient & Accepted Scottish Rite, Southern Jurisdiction of the USA, but is not used universally among other Supreme Councils. The white cap embroidered with the red and gold Patriarchal Cross designates that one has been coronated a 33° Inspector General Honorary. When a Scottish Rite Mason has been a 32° KCCH for four years, has attained the age of 35, and has continued to provide outstanding service to the Rite, he is eligible to received the 33° Inspector General Honorary. These Brothers are not active members of the Supreme Council, but compose the pool from which those active members are chosen from. The white cap adorned with the gold Teutonic cross of the Grand Cross and surrounded by a band of dark blue velvet bordered in gold is worn by those distinguished Brothers who have been awarded the Grand Cross of the Court of Honor. This is the highest decoration which can be bestowed on an Inspector General Honorary for exceptional services. This rank and designation is not a degree, and members who hold it are designated 33° GCCH or 33° GC. The white cap adorned with the red and gold Patriarchal Cross and surrounded by a band of red velvet bordered in gold is worn by Brothers who serve as a Deputy of the Supreme Council. In Orients (states, territories, or countries) that do not have an active member of the Supreme Council, the Sovereign Grand Commander can appoint a Deputy to serve as SGIG of that particular Orient, but that does not give him active membership or a vote on the Supreme Council. The purple cap emblazoned with a purple and gold Patriarchal Cross with crosslets and surrounded by a band of purple velvet, bordered in gold and decorated with a gold vine of laurel leaves and berries is worn by a Sovereign Grand Inspector General (SGIG) and is an active member of the Supreme Council. There is only one active member for an Orient and the SGIG is the highest ranking officer of the Scottish Rite in the Orient. The violet cap decorated with the Salem Cross with crosslets and surrounded by a band of violet velvet with a gold vine of laurel leaves and berries is worn only by the Sovereign Grand Commander of the Ancient & Accepted Scottish Rite. The Sovereign Grand Commander is the highest ranking officer of the Supreme Council invested with the power of supervision and administration within its jurisdiction. Here is the tentative schedule of events for the 2018 Masonic Week that will be held at the Hyatt Regency, Crystal CIty near the Regan National Airport. 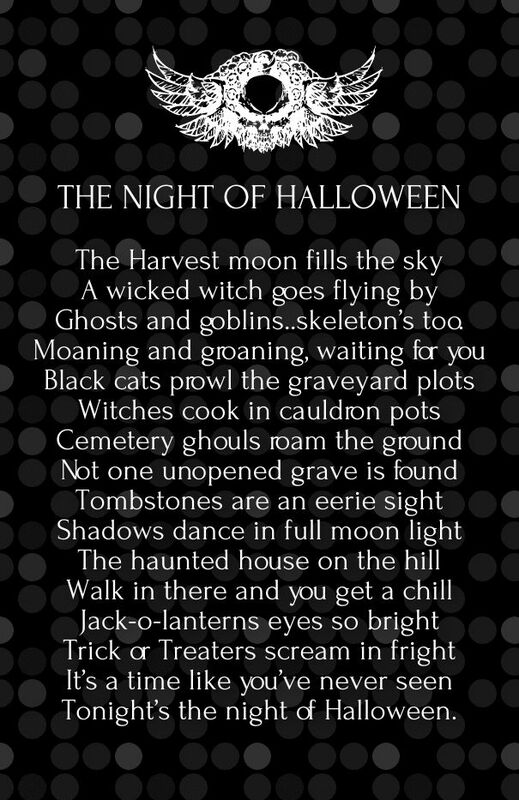 This is the first in a series where I will be researching some of the words and phrases used within Freemasonry. As this is the first article in the series I'll start with the most important and basic organizational unit of Freemasonry, the Lodge. According to the Idaho Masonic monitor, "a Lodge is a place where Masons assemble and work; Hence that Assembly, or duly organized Society of Msaons, is called a Lodge, and every Brother ought to belong to one, and to be subject to its Bylaws and General Regulations." According to the dictionary, the word "lodge" is defined as "a small, makeshift or crude shelter or habitation" or "the meeting place of a branch of certain fraternal organizations." The word "Lodge" is rooted in the 13th century Middle English word "logge" meaning "small building or hut" and can be traced back to the Proto-Germanic word "laubja" meaning "shelter." While the roots of Freemasonry are lost to time and is the great enigma of the Craft, we know that much of our near history can be traced to the Operative Masonic guilds of England. In creating their work area, the medieval guilds would erect a lodge erected along side the structure under construction. How and when the operatives started using the word "lodge" is unknown, but we know that where those operative craftsmen assembled, it was referred to as a lodge. Lodges today refer to both a place where assembled Brothers may initiate, pass, and raise all those whom they find worthy and the collective term for the members who meet there. While today our Lodges are fixed locations, the early speculative Lodges were much more private and transitional meaning that they would be located in private homes or rented out rooms in a bar (not the club scene we think of today, but something akin to a hotel conference room). From Albert Mackey's Encyclopedia of Freemasonry, a "regular Warranted Lodge consists in reality of four Lodges" where he states that a Lodge is composed of a Lodge to conduct business meetings, "Initiated in a Lodge of Apprentices, is Passed in a Lodge of Fellowcraft, is Raised in a Lodge of Master Masons." Lodges have a name and after often followed by a number (ie Idaho Lodge No.1), but this isn't always the case; in some jurisdictions they don't use numbers such as under the Grand Lodge of Massachusetts. Lodges are often referred to as a Blue Lodges, (Ancient) Craft Lodges, St. Johns' Lodges, or Symbolic Lodges. The term "blue Lodge" refers to the traditional color of regalia in Lodges. Craft Lodge is used more often in Britain than Blue Lodge. As the central myth surrounding Freemasonry surrounds King Solomon's Temple, the Lodge is said to be patterned after aspects of King Solomon’s Temple. There are many variations throughout the world, depending on differences in customs, rituals, and rules, but in general, lodge rooms are arranged in a very similar fashion. Lodges can be decorated very elaborately or very simply; you find very ornate Lodges in large cities and back East while in rural areas they are often of simple designs. A building may have multiple Lodge rooms and it was an older custom to refer to such buildings as Temples (referring back to King Solomon's Temple), but due to confusion and misunderstandings of the role of religion in Freemasonry, this has been abandoned and the word "temple" has been removed from their buildings. 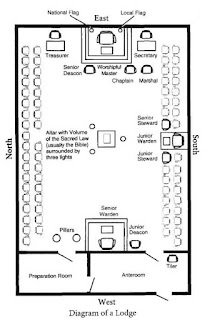 The modern Masonic lodge is a rectangular room, with seating around the perimeter with the center of the room where the rituals and ceremonies take place. Lodges as a representation of King Solomon's Temple which itself was an exact model for the Tabernacle erected by Moses, which was situated due East and West to commemorate the East wind which assisted in the exodus of the Jews out of the land of Egypt. Now this isn't always physically possible to orient a Lodge room due east, but regardless, when you walk into the lodge room and face the Worshipful Master's chair, you’re symbolically facing the East. All Lodges hold an altar in it where a sacred book is placed (in the US it is usually the Bible, but it could also be the Koran or Torah). In the US, the altar is found in the center of the room while in other parts of the world it is often found directly in front of the Worshipful Master's chair. Surrounding or placed next to the altar are three lights (the number three being extremely important in Freemasonry). The three principal officers are stationed around the room as such: the Worshipful Master is in the East on a dias of three steps, the Senior Warden is in the West on a platform of two steps, the Junior Warden is in the South on a single step. 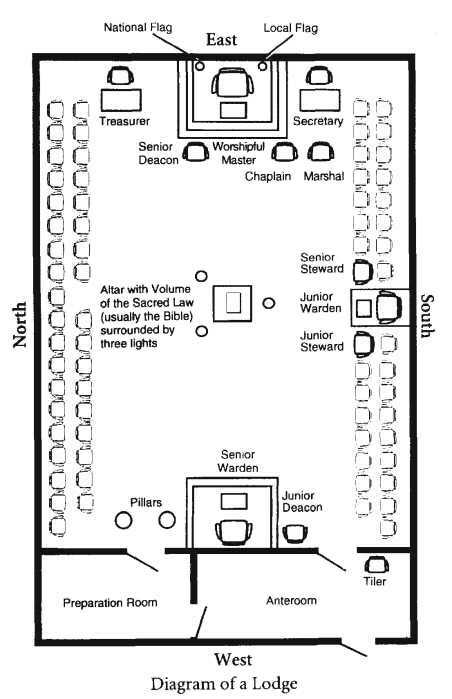 The rest of the officers are placed around the Lodge as defined by their ritual and Constitution (see the diagram below). Most Lodge meet at least once a month for a business meeting, but can also have special meetings for conducting initiations on their respective candidates. Some Lodges only meet quarterly or annually, but those are special Lodges like Lodges of Instruction, Research Lodges, or Historic Lodges. No other part of Freemasonry is accessible until one has received the three degrees of the Blue Lodge. Admission to a Lodge is by petition and only through a Blue Lodge can one attain the title of Freemason.